Risotto is a new thing to me. Don’t get me wrong – I’ve had plenty of them in restaurants. However, I don’t eat it often because it sends me into a carbohydrate k-hole. This having been said, I certainly don’t make it often at home. I blogged about my first risotto at home back in May – not long ago. I had some trepidation about it then…and this time, I’ll admit it still made me nervous. I was having flashbacks of Gordon Ramsey on Hell’s Kitchen holding the plate of sticky risotto upside down and saying it looked like "a dog’s dinner". I had to put my fears aside when I found out that risotto was the theme chosen for Hay Hay It’s Donna Day, hosted this time by Cenzina at il cavoletto di bruxelle. It’s a great theme because its such a versatile dish. You can put almost anything in it and its bound to be good. – Three words (or one word broken up into three parts? ): mise en place. Seriously. Have all of your ducks in a row before you get started. That way, you’re not scrambling about for ingredients and not stirring. – One more word: Stir. – An extra set of hands is helpful but not necessary. This time, I made the dish during a photo shoot with Tony Clark. Not only was he good for ladling my stock into the pan while I stirred…but he was a great taste tester, took a great photo of it, and was there for moral support. In the end, my risotto turned out like a dream. My recipe includes radicchio, which I adore the taste of. Mixed with a creamy smoked mozzarella, the risotto was a wonderful contrast in flavors and textures. The cheese was divine in the creamy risotto. The radicchio kept some of its integrity even after being wilted in the rice, giving a nice bitter crunch along with the al dente rice. Add about 1/2 cup of the simmering broth to the rice and cook, stirring frequently, until the broth has been completely absorbed. The rice and broth should bubble gently; adjust the heat as needed. Continue cooking the rice, adding broth 1/2 cup at a time and allowing the rice to absorb the broth before adding the next 1/2 cup. Cook the rice in this way until almost tender, about 20 minutes. Add the radicchio and parsley and cook until the radicchio and the rice are tender, about 5 minutes more. The broth that hasn’t been absorbed should be thickened by the starch from the rice. You may not need to use all of the liquid, or you may need more broth or some water. It was a good thing I could have a laddle in one hand and a holiday beverage in the other. As I remember, it went something like this…MORE STOCK, NOW PICTURE BOY! Great job Tami. I’m sure it tasted as good as it looks. Thanks for entering. he…he..making risotto is a two person team one to stir and a second person to reaffirm that you’ve added enough stock…. What a beautiful and appropriate tribute. I love radicchio, but never know what to do with it (apart from putting in salads), but including in a risotto is a GREAT idea. Thanks for this recipe. Congrats for winning the risotto contest! 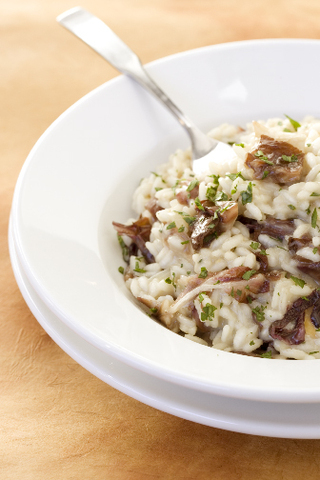 This risotto looks (and “reads”) absolutely yummie. Ciao!